OutLinker helps you empty your OutLook inbox by creating tasks in MindManager and hyperlinking them to your archived messages. It can also embed a copy of the message as an attachment and/or note. 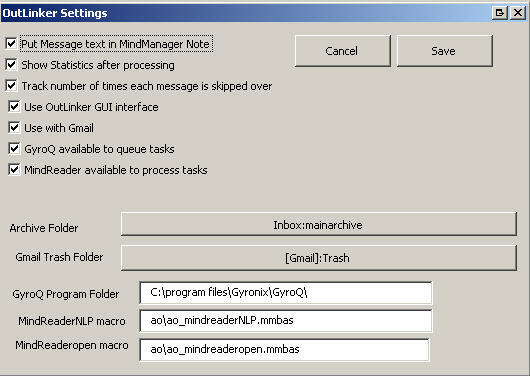 You can use MindReader to enhance the processing of the tasks or just have them sent to outlookcapture.mmap. Utilizing MindReader allows you to send tasks to specific maps as well as assign responsibilities, dates, priorities, categories and areas. Linking the tasks to the original email, task or appointment in Outlook can faccilitate acting on them quickly. OutLinker Lite is identical to OutLinker but removes the MindManager-related dependencies and functionality. It is is intended for OutLook-only systems. The approach follows the Getting Things Done (GTD) model of time management and builds on the the project management tools provided through MindManager, MindReader, GyroQ and ResultsManager. Messages are saved to a pst file/folder or to a subfolder of the inbox. The software creates hyperlink so that the activity associated with the message. It also can add the content of the message to the note of the activity (see OutLinker Settings). OutLinker can also be used to transfer a set of tasks captured in Outlook/PDA to MindManager an to create MindManager topics associated with appointments. Recent versions of OutLinker have been enhanced with tools to identify bulk mail, navigate across coversation threads, and track how many times you have skipped over that message you are avoiding dealing with. New: OutLook Categories are now read into the next action in form [*category1][*category2]. If a next action is entered, any bracketed text in the form [*text] will be used to set the category on the saved message. This is being implemented to enable the program to be used with Taglocity. February 16, 2010 Update: "OutLinker 2010"
If you are using version 6, download one of the above and follow instructions for adding the version 6 type library. If you don't have MindManager, download OutLinker Lite. This will replace your vbaproject.otm file in c:\Documents and Settings\username\Application Data\Microsoft\OutLook\ with the OutLinker version. Do not use this approach if you have other custom macros installed. The setup may warn you that the destination folder already exists, which is to be expected. If you don't have MindManager, download OutLinker Lite instead. If you are using MindManager 6 instead of 8, Add a reference to the MindManager 6 Type Library as described in Manually Adding Outlinker Macro. There is a new download above that should have the v7 type library selected. Set your macro security to "medium" or "Warning for all macros". To avoid the warning prompt, sign the macro. The "best" version of OutLinker is the "beta" version of Outlinker, which is the main download link provided. If you run into an unexpected bug introduced by latest feature, the previous "stable" version is available as a download as a fall back. Under MindManager Options,Add-ins, un-check "Browser"
In Outlook, use Tools/Customize/Commands and drag the macro "Project1.OutLinker" macro onto your menu bar. If you don't see the macro listed, you may need to adjust your security settings first. 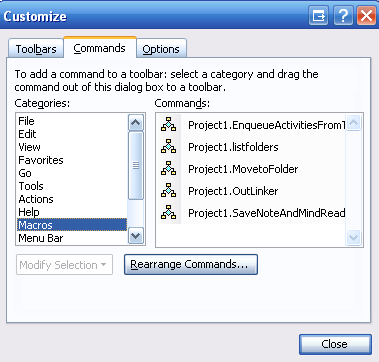 Run the program by selecting one or more messages and clicking on the Project1.Outlinker button. Start by practicing on unimportant messages that you were going to delete anyway until you get the hang of the program and make sure it is working for you. Click on buttons and checkboxes as needed and/or enter a better next action with mindreader keywords. When you first run OutLinker, it will try to use an OutLook folder "mainarchive" in an Outlook store of "Personal Folders". If either doesn't exist you will be prompted to browse for the folder you want to use. It will be easier if you have created the destination ahead of time. You can change this under the "options" button. If you are using a basic Gmail IMAP connection, the archive command will delete the local copy and leave the message on in the gmail archive. If you delete the message, it will be moved to the gmail trash folder. There is also an Outlinker Command Line Interface for those that prefer the keyboard to the mouse. Outlook 2003/2007 (not tested with Outlook XP). Outlinker will not work in "out of the box" in Outlook 2007 as MS has removed support for the Outlook protocol. 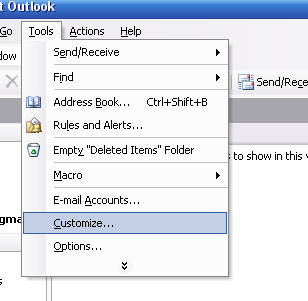 To enable the the Outlook URI protocol in Outlook 2007 your registry needs some additions. Download the registry settings file Media:Outlook2007links.reg and choose to download the target to disk. There is also a script for 64bit vista. Edit it if you have a non-standard Outlook.exe location. Double click on it to run it. MindManager 6, 7, or 8. The program defaults to looking for MindManager 8. Change the version in OutLinker Settings to 6 or 7 if you are not using version 8). The next release will make this adjustment automatically. Optional: MindReader and/or GyroQ 1.9.4.7 or 2.0. Install the latest version of MindReader using the Setup program. Note that the default MindReader macro locations changed in January 2009. If you want to use earlier version you must change the locations in OutLinker Settings. If you are using GyroQ, you should clear you queue before testing OutLinker. You should also click on "Options" box and check the "Poll Queue file status". This will remind you that you have added tasks to the queue. OutLinker was derived from an outstanding set of OutLook macros created by Mike Wilkerson. "Renaldostheold" has been instrumental in driving and testing its enhanced functionality. This page was last modified on 22 February 2012, at 10:40. This page has been accessed 171,849 times.